Wheeww! I am back! This post has taken a really long time before it materialized, nonetheless it is already here and I am ecstatic that I was able to post this before November ensues! A lot has happened and changed these past few months which took a great deal of my time and got me really, really busy but I am happy to say that I am in a great place right now and I am slowly adapting to the new environment. I am itching to tell you more about why I have been gone for so long and seemingly took a hiatus from writing but I think there's a lot of time for that and believe me, it was not intentional! Okay! On to what this post is really about! 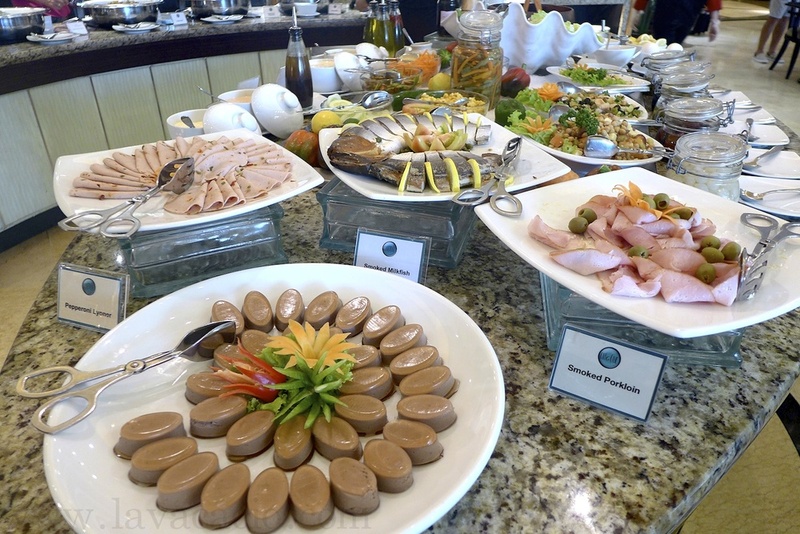 The Bellevue Hotels and Resorts is a Filipino owned company that manages one of the five-star hotels in Panglao Island which is the The Bellevue Resort. Other than this, they also have deluxe and standard classes hotels located in the metro to cater to people who are travelling on a budget or are budget savvy. One of these hotels is the Bellevue Manila. 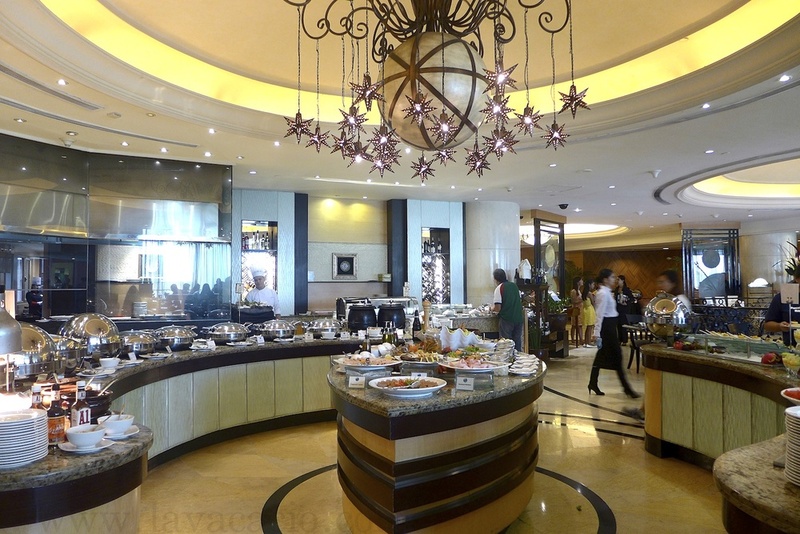 Since we have already had a first-hand experience of their service and food at the renowned Bellevue Resort and it was also nearing my birthday, we found the perfect excuse, or opportunity rather, to buy buffet vouchers for the whole family upon chancing on their temporary stall in Greenbelt 5. The best part is their buffet vouchers in Cafe d' Asie were discounted! Talking about perfect timing! We had some issue about the reservation which we called in days before the actual date of our visit but I will not anymore delve deeper into that as the maître d’hôtel immediately relieved the situation and she did not give anymore our temper the chance to explode! On to the food! 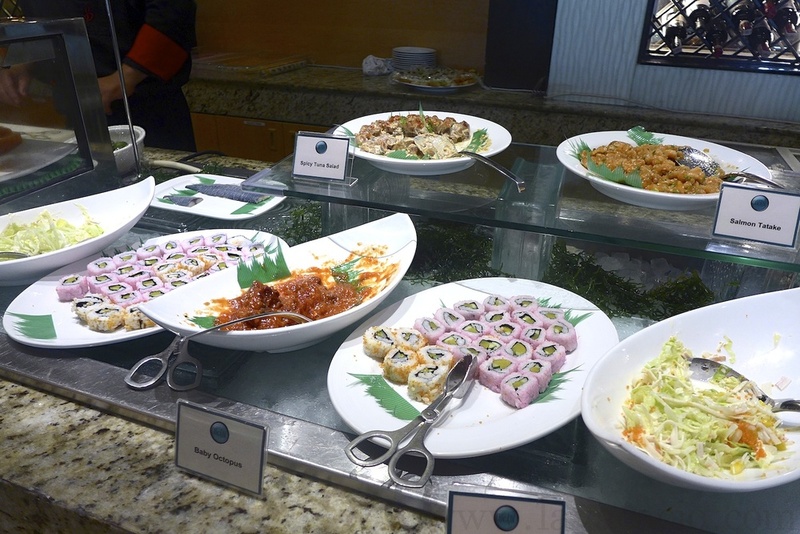 The buffet is pretty much varied but not to the point of overwhelming the diners. Also, I really had this feeling that the buffet was really there to please me on my special day because it consists of every food that I want and constantly crave for! 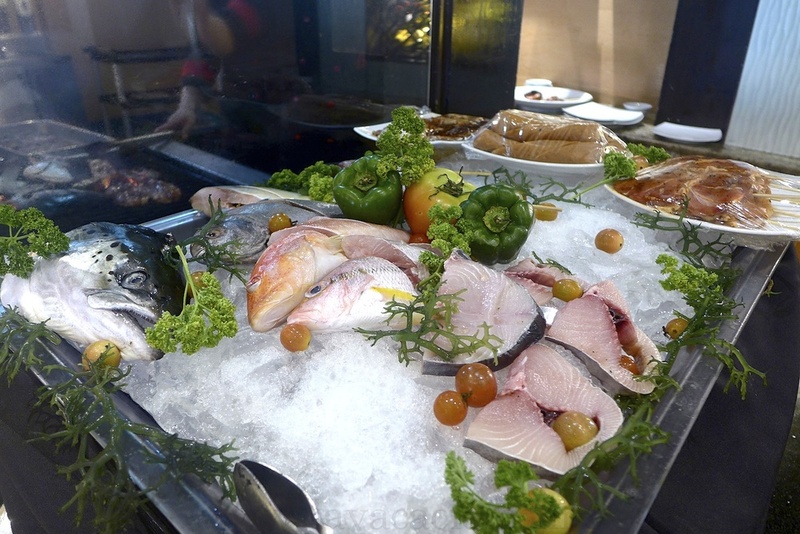 Lamb, salmon, maki, sashimi, cold cuts, gelato, bread pudding and desserts galore, you see? All of these sit on top of my food hierarchy! I was a happy kid! This section made my heart skip a beat and my hands fidgety as I could not decide immediately what to get first! But of course, leaning towards those which I like best, I took large spoonfuls of the tuna and salmon sashimi and a handful of baby octopus. A plate of Spicy Tuna Sashimi salad is a usual sight whenever we eat in a Japanese restaurant but Salmon Sashimi salad? It is something that I do not usually encounter. With nothing to compare it from, this salmon sashimi salad immediately captured my expecting heart with its slight sweetness brought about by the sauce and its slight nuttiness brought about by the sesame seeds! Also, if there's one thing I like about these salads, even non-raw foods eaters will love these! 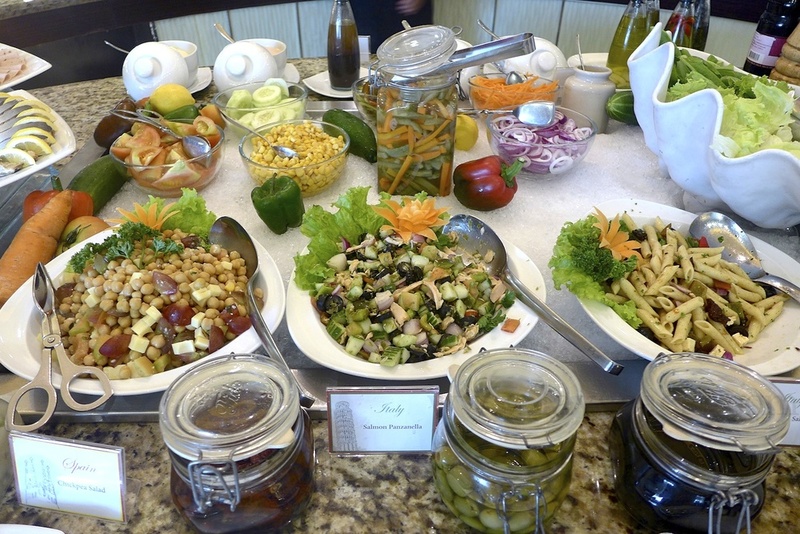 Not an ultimate fan of salads but it is still nice to know that they have different variety of salads which originated or are specialties of other countries. Bellevue also has some cold cuts. Yummy! I think that nice plate over there with those brown and oval things are liver pates. Unfortunately, I was not able to taste this when we were there! At least there is something to look forward to when we come back here. If you want to make your own salad combi, this designated station very much lets you do that! To make your salad taste more exciting and inviting, taking the frontline is the extensive choices of dressings to complement your salad! A grilled food lover? You can take your pick from the different skewers, fish and sausages placed on top of this iced counter and hand it over to the grilling guy. Make sure to wait for it on-the-spot or come back for it after a while because somebody might pick up your goodies before you do! We just want to make sure that you get what is yours! There is also a station solely dedicated for pasta lover here! Red sauce, white sauce or a combination of both, the pasta area surely has that perfect pasta sauce that you are looking for. Do not forget to top your pasta off with an equally enticing fruit or vegetable to give more aroma and nice flavors to your creation. 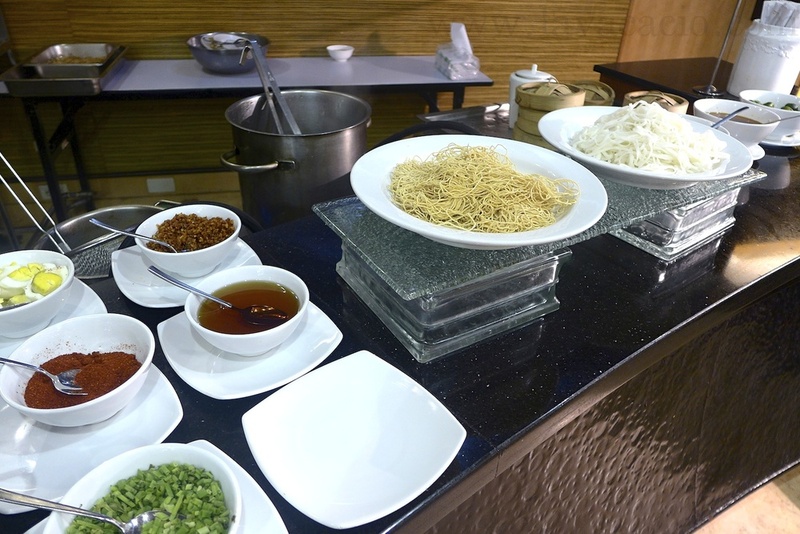 Palate looks for a more Asian flavor than Western? To counter the pasta counter is the noodle counter beside it. A sip of that hot and brothy soup would surely alleviate in an instant a gloomy weather and a gloomy feeling. On to the entrees! This is the Ratatouille. The Salmon Beurre Blanc which is creamy and the meat flavorful and soft. A dose of Chicken with Mushroom. Pork Goulash which is a popular dish in Hungary. And the lamb skewers which surprised me and which I chowed down for fear that this will not anymore be refilled. On to the breads and desserts. Of course, the Bellevue experience would not be complete without a dollop of bread pudding in your plate. I have tasted the Bellevue resort's version and loved it to bits to my utter surprise so I could not help but dug in in this carbohydrate-packed container also. It was good, I liked it but not with much enthusiasm as the one in Bellevue resort. Not only are the desserts eye-candy but they are also delicious! The mango mousse, the pistachio cake, the blueberry cheesecake are heavenly! They were really heaven in mini packages. I am lucky that I was able to grab and have a bite of their lovely macarons as they are already gone in a snap when I came back for more! 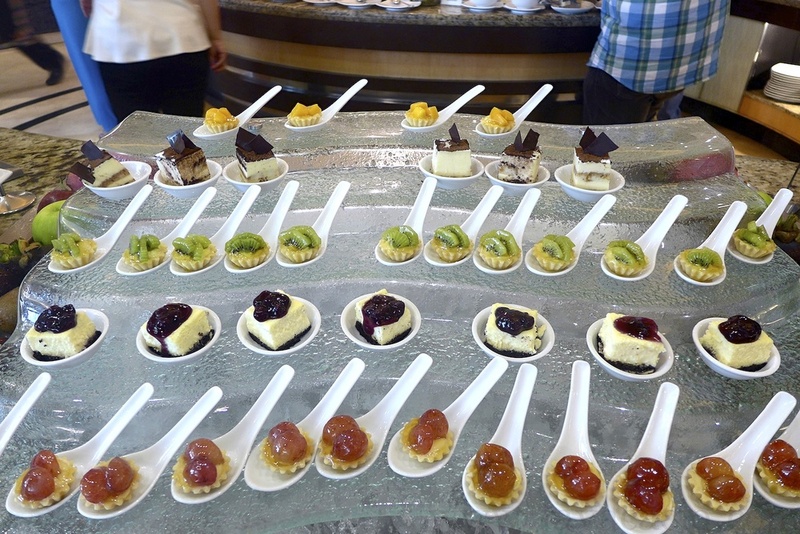 There were also tarts with different fruit toppings like grapes, mango and kiwi! Ooh! 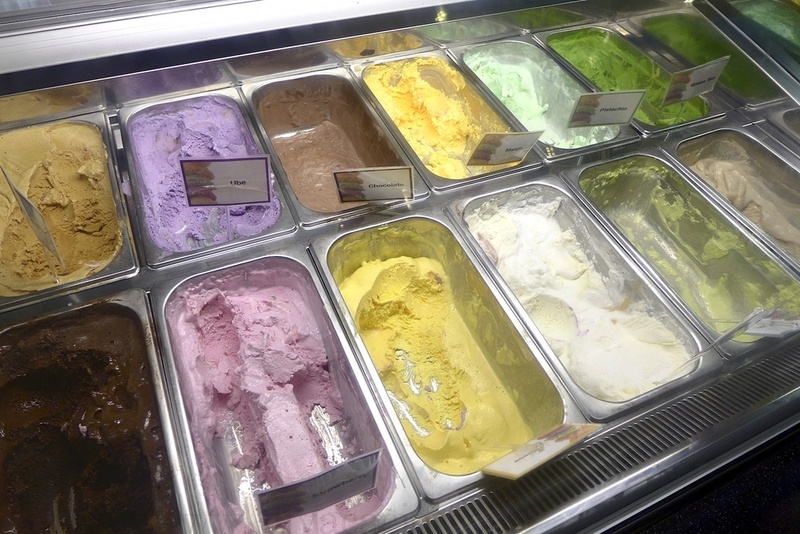 What is nice is that they even have their own gelato counter! I went literally nuts and ballistic when I saw this! I had a hard time picking just a couple of flavors because they are all so dreamy and creamy to look at that I would want to get a scoop of all of them! But since I am not the type who goes gaga and hoards to her heart's content and I since I know my limit and this would only entail leftovers (how I hate it when I see left overs in a plate) , I settled with just two flavors. Pistachio and Green tea they are! Looks like I subconsciously chose the ones which are green. A cereal counter also for the kids! And these jars of bite-sized chocolates with nuts and dried fruits completed my meal with a silently sounding burp! 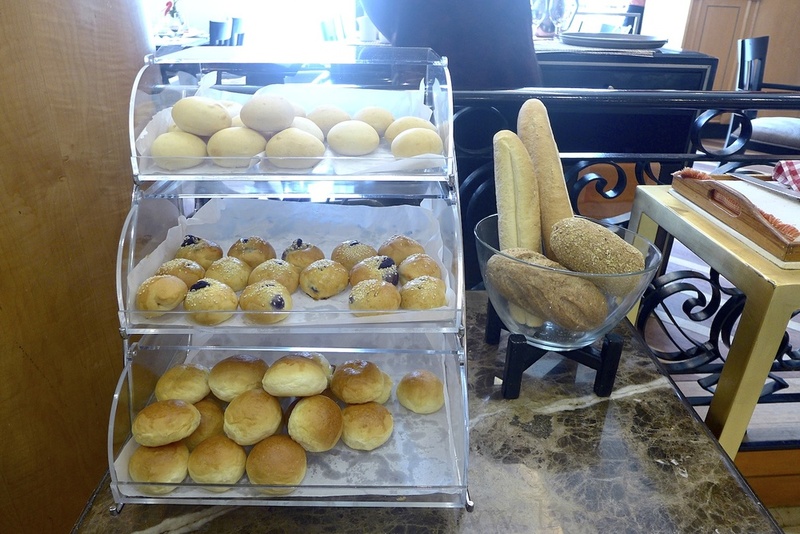 I super loved these treats that I even took a handful of which to eat on my way down to the hotel's lobby. 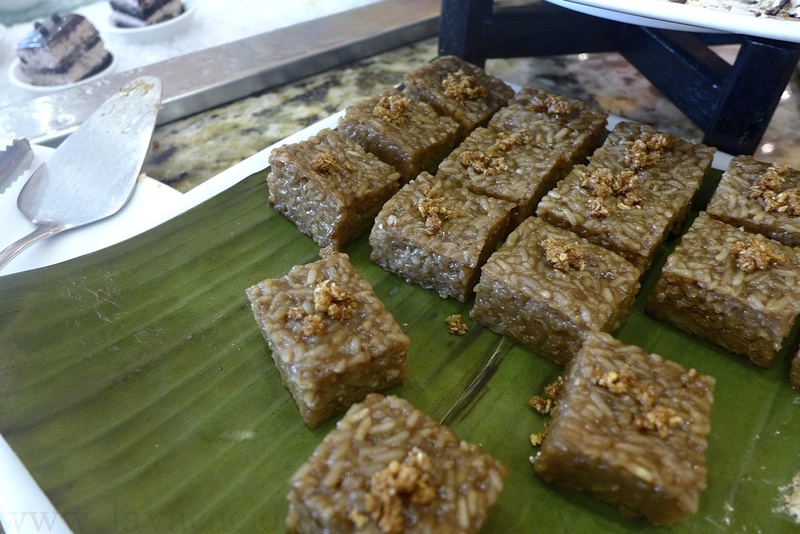 Cafe d' Asie also serves Filipino desserts like the biko and cassava cake! 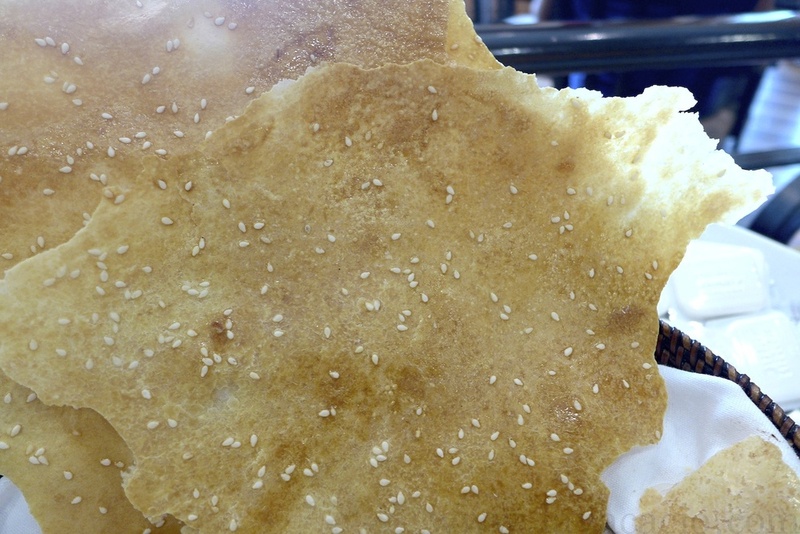 Another combination that surprise me was this papadam with sesame seeds partnered with the Blue Cheese. You just gotta to try it also! 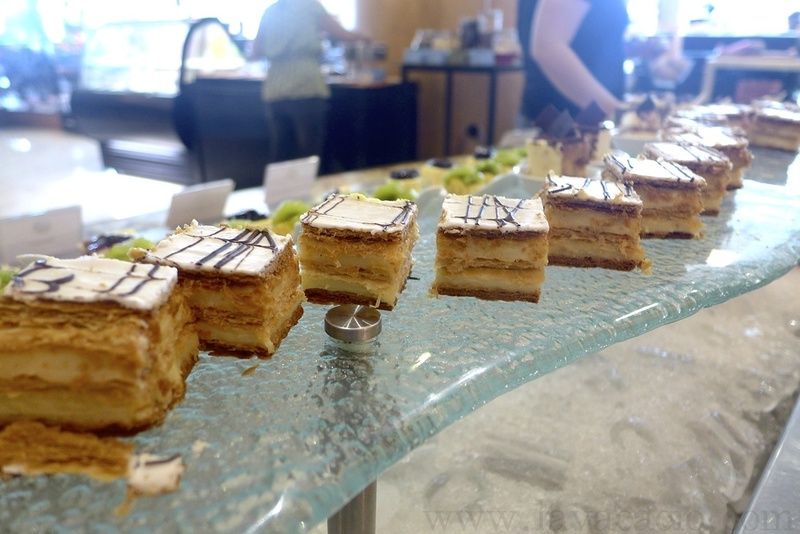 The overall experience at the Cafe d' Asie in Bellevue Manila was a nice one. Our server was very attentive to our needs and he also kept us entertained with his passingly and effortlessly-delivered jokes. As for the food, I have nothing to complain about since there was a great variety of cuisines and dishes there and like I said earlier almost all dishes that I love were all there! The influx of food was continuous, the flavors were enticing and the company superb. What more could I ask for really? I am blessed and I am just glad that I was able to celebrate my birthday with those people who mean a lot to me.